The Technical Group's Private Members’ Motion calling for legislation for the X Case has been defeated by 101 to 27 in the Dáil. The bill would have allowed for the termination of a pregnancy if a woman's life was at risk. 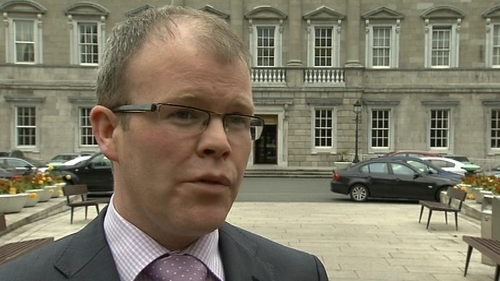 Sinn Fein TD Peadar Tóibín did not vote with his party. The Meath West deputy, who said he could not back a Sinn Fein motion on the issue last week, was not in the Chamber for tonight's vote. During the debate, Deputy Mary Lou McDonald told the House Sinn Féin would be supporting the bill. She said her party recognises the urgency of the situation, given the years of inertia on the part of successive governments. Deputy McDonald said the leaking of the Expert Group on Abortion report was a kind of “game playing” on the part of the Government. She said the report made it clear legislation was needed, but that the conditions would be restrictive. Health Minister James Reilly said that he wanted to reiterate his determination to give the women of Ireland and the health professionals the clarity they need. He said this Government, unlike others, would not allow the situation to go unaddressed. Dr Reilly said that he wanted to put his gratitude to the expert group for the work they had done and that he hoped a cross-party consensus could be achieved in light of what the expert group had concluded. He said that there could not be any uncertainty over the legal entitlements of a woman to have an abortion under certain circumstances. Minister Reilly said that while he shared Deputy Clare Daly's concern for Ireland's pregnant women, he called on TDs to oppose it because it was flawed and they needed more time to consider the findings of the expert group. Deputy Daly had introduced the Medical Treatment (Termination of Pregnancy in Case of Risk to Life of Pregnant Woman) Bill last night. Dr Reilly called on everyone to participate in the 20 hours of debate set aside on the issue in the coming weeks. He said they wanted to provide certainty and clarity for those affected.